We’ve supported campaign member Steve Martin’s demand for an inquest into the circumstances of his brother’s death in squalor without hot water or heating in Ipswich whilst under the care of Norfolk and Suffolk NHS Foundation Trust (NSFT). David Martin’s untimely death at only 52 has been featured by BBC Look East and has appeared in the Ipswich Star. 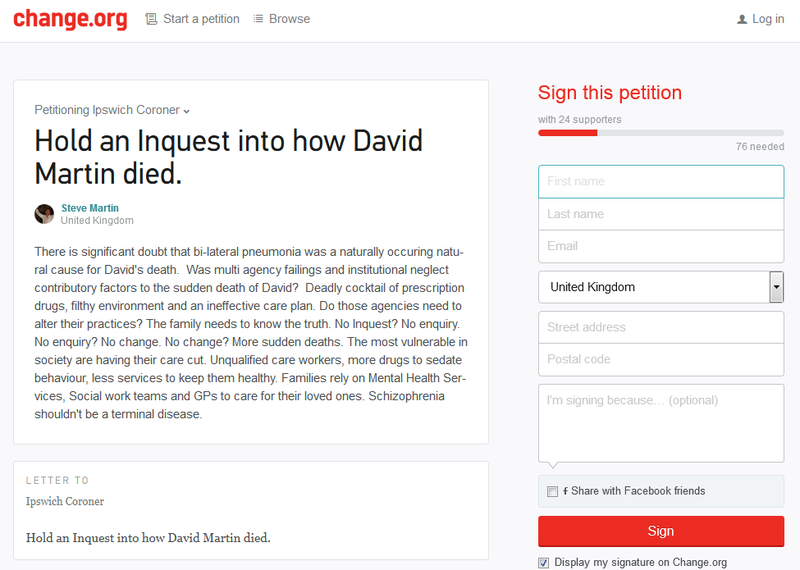 Steve organised this petition. Society has tolerated the early and often unnecessary deaths of people with mental illnesses for too long: frontline staff must be provided with the time and resources to deliver the decent and caring service they joined the NHS to provide. We’re delighted that the Suffolk Coroner has responded to public concern and will now investigate the circumstances of David’s death. Seeing the lives of mental health service users as cheaper than those of others in society is one of the worst manifestations of stigma. Let’s hope that this inquest marks the beginning of its end. “The thing that most people missed about David was that he was just a really good bloke, he’d do anything for a mate and wouldn’t put up with anything like animal cruelty, racism or bullying. He’d stick up for the little guy and had friends stay with him, long term that had serious disabilities and illness so he could care for them. He was a poet and an artist and was incredibly intelligent. His knowledge of history and current affairs had him able to debate with the best of them. He was loved by his family. His nephew and nieces were charmed by his roguish mischief and entertained by his ability to mock his own siblings and conspire with the children. In his world he was a warrior and a hero. His episodes threw him into the role of saving the world and defending the innocent. He never let his fear stop him, his disabilities alter him or society shape his thinking. “You wouldn’t let a dog sleep in there” Community Care Worker. “David in his own environment.” Assistant practitioner. These ‘carers’ missed who he was. Our family relied on their expertise and professionalism to care for him. I’m so sorry to hear your news, you can contact me in a couple of weeks, i’m out of the country till the 18th.